Auto manufacturing means jobs up and down the value chain, advancements in innovation, research and development in new products and manufacturing processes, tax revenues and economic prosperity to communities across Canada. New automotive manufacturing investment decisions have never been more globally competitive or complex. Federal and provincial policies must provide the certainty and predictability industry needs to make new investment decisions, with meaningful, tangible, and effective support measures. It requires a collaborative and easy to understand partnership with governments. Canada’s auto manufacturing sector is a leader in the advancement of innovative technologies in both manufacturing and product development that support the public policy objectives of government. Auto manufacturing contributes approximately $20 billion to GDP, directly employs 115,000 people (500,000 direct/indirect) and drives Canada’s productivity growth. Canadian assembled vehicles are the number one manufactured export and second export overall. 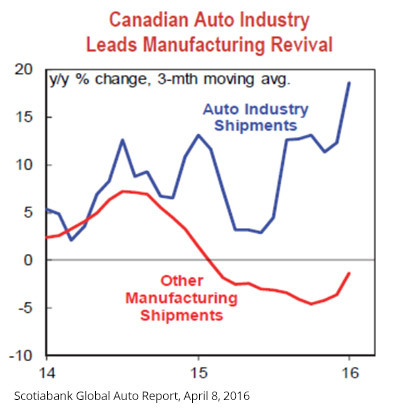 Canada’s auto sector is a key driver of the Canadian economy and a key anchor for economic spinoff due to its 7-9/1 job multiplier – the highest of any manufacturing sector. Canada’s auto assembly is also high-tech advanced manufacturing and drives research and innovation in Canada by connecting Canadian universities with global hubs for automotive research and investment. However, Canada’s auto industry is at an important inflection point in the highly competitive global auto industry: Notable on the manufacturing & assembly side, Canadian vehicle production has declined since 2000 as a result of a high Canadian dollar, a high operating cost environment, and structural changes in the global auto industry as vehicle assembly (along with suppliers) moves from high cost to low cost countries like Mexico, and shifts production to high growth markets in Asia Pacific. An Ontario Cap & Trade policy that will not impact future cost uncertainty versus other jurisdictions including the United States. Higher manufacturing costs in Ontario as a result of the Cap & Trade program (direct fuel purchases to run plants, increased electricity costs, or increased indirect costs for suppliers and transport of goods) will increase the risk and the competitive viability of existing automotive plants in Ontario. Electric Vehicle (EV) policies such as consumer vehicle incentive and a recharging infrastructure that support consumer adoption of electrified vehicles – not quotas that hurt dealers businesses and potentially limit consumer choice. North American harmonized vehicle regulations which enable automakers to continue to design and build once for the North American marketplace, cost efficiently. Canadian fuel efficiency/greenhouse gas regulations need to be national and harmonized with the US, Canada’s largest trading partner. New regulations should not create unique-to-Canada requirements or costs. An innovation ecosystem and talent base that helps grow Canada-based advanced engineering and R&D collaboration with universities and suppliers for global supply, (not just local plants). More efficient and straightforward temporary international worker process for specialized company expertise. Border, ports and transportation infrastructure that are efficient and cost competitive and support the “just in time” supply of parts and components and allows for efficient movement of finished product to export markets. Parts and components may cross the NAFTA countries’ borders as many as 8 times before final assembly.